PARIS/ROME—France recalled its ambassador to Italy on Feb. 7, a remarkable diplomatic split between neighbors and European Union allies, after what it described as “repeated, baseless” attacks by Italian political leaders against France. Diplomats said Paris acted after a series of insults from Italy, capped by Deputy Prime Minister Luigi di Maio’s decision to meet with members of France’s “yellow vest” movement, which has mounted a months-long and sometimes violent campaign against French President Emmanuel Macron. Di Maio, head of the anti-establishment 5-Star movement, which is in a governing coalition with the League, defended his meeting with the “yellow vests,” and drew a distinction between Macron and the French people. “There was behavior by a member of the Italian government that we consider unusual, unfriendly, and that follows a number of official Italian statements that we find hard to understand in terms of how they help Franco-Italian relations,” she told France Info. But in recent weeks the exchanges have grown sharper and more personal. Di Maio accused France last month of fueling poverty in Africa, suggesting it was a neo-colonial power. 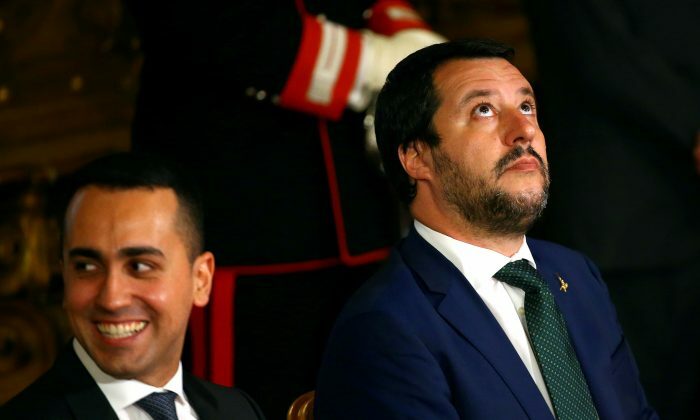 Salvini accused France of exploiting the unrest in Libya to benefit oil company Total, which competes with Italy’s ENI in the development of regional energy assets. Italian TV channel La 7 broadcast footage showing the two leaders talking at a bar, with Conte telling Merkel that Di Maio was attacking France because he was down in the polls ahead of the European elections and needed an enemy. “So they say what are the issues that can help us during the campaign … In the political campaign, our friend is Germany and so we had to do the campaign against France,” he said, prompting laughter from Merkel. Salvini sought to calm the tone on Feb. 7, saying he did not want to argue with France and was happy to meet Macron. As president, Macron would normally meet with other heads of state or government, not deputies. While rare, the French action is not unprecedented among EU members. In 2016, Greece recalled its ambassador to Austria, and, in 2017, Hungary withdrew its envoy to the Netherlands.